Yes, you read that correctly. Sausage, waffles and buffalo syrup in the same sentence. It's not sausage and waffles, it's a waffle with sausage in it. Open your mind, allow yourself to think outside the box. Don't worry about what's "supposed" to go together, just get out your pan, mixing bowls, and waffle iron, this recipe will do the rest. Ian loves waffles. He could kind of see what I was doing in the kitchen on Saturday, he smelled the sausage and saw me get out the waffle iron, he was confused. "Are we having meat waffles? ", he asked. Yes, yes we are. He couldn't decide if it sounded good or not. He ate 2, so there's your answer. The sausage here came from our beef CSA, J&J Grassfed Beef. We opted for a package that included 1 pound of bulk beef sausage. It is only slightly flavored, which is why I added some additional sausage spices. Next up, Salmon waffles! No, I'm kidding, that would be disgusting. 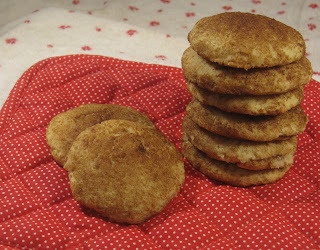 Just try these already! Note: My waffle iron is 8" in diameter, and this recipe made 3. Brown sausage in pan over medium-high heat, breaking meat up into small pieces. When no longer pink, remove from pan and let drain on paper towels. Mix your dry waffle ingredients together in large bowl. In a small bowl, whisk eggs with honey until well combined. Add wet to dry and mix thoroughly. Add in crumbled sausage. Ladle batter into waffle iron and cook according to waffle iron directions. Mine took about a 1/2 cup of batter and cooked for approximately 4 minutes. While your first waffle cooks, mix syrup ingredients together in small bowl. 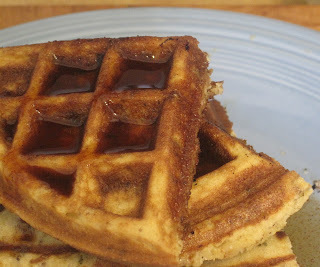 Drizzle nicely browned waffle with syrup and enjoy! 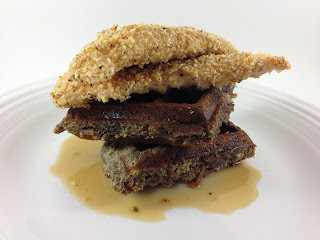 Need to find a Paleo version of fried chicken to go with the waffles for Paleo chicken and waffles.